Yesterday, the temperature in the Philly area reached almost 70 degrees. This is, needless to say, unseasonably warm. I was unable to get out with my camera in the daylight hours but, with the temperatures still in the mid-60’s after 8 PM, my neighbor and I decided to head down to the river and take some night photos. Even down by the river, where the wind was quite strong, the temperature remained wonderfully pleasant. Winter shots, especially at night, are often a rushed affair — its a battle to frame some good photos before your body screams to get back indoors. Last night, however, we took our time and walked to the river, set up our tripods, and framed our shots. We were out for an hour or so, and profound lack of January chill was a nice break. I took many exposures of the bridge, which I merged to created a beautiful HDR photo. These can be seen on my SmugMug page, but my favorite photo of the night is below. 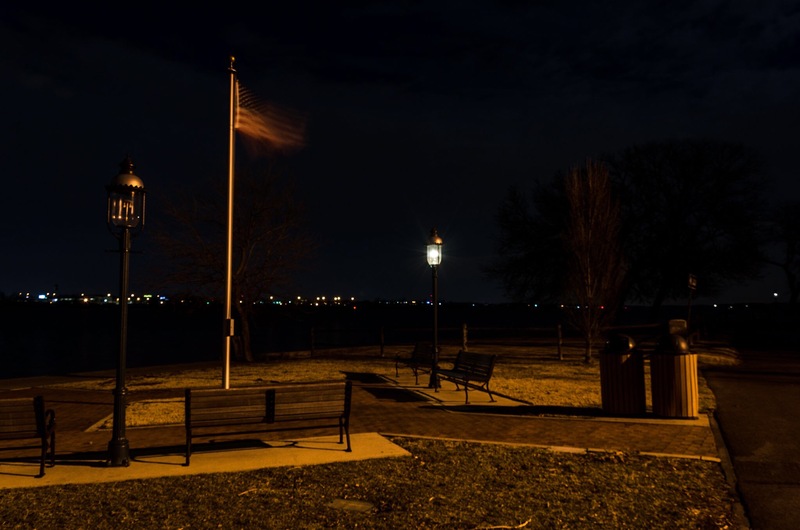 The flag in the small park was whipping out in the breeze, and when captured with a long exposure it became like a ghost — almost painted instead of photographed. The wind even gave it the semblance of brush strokes.